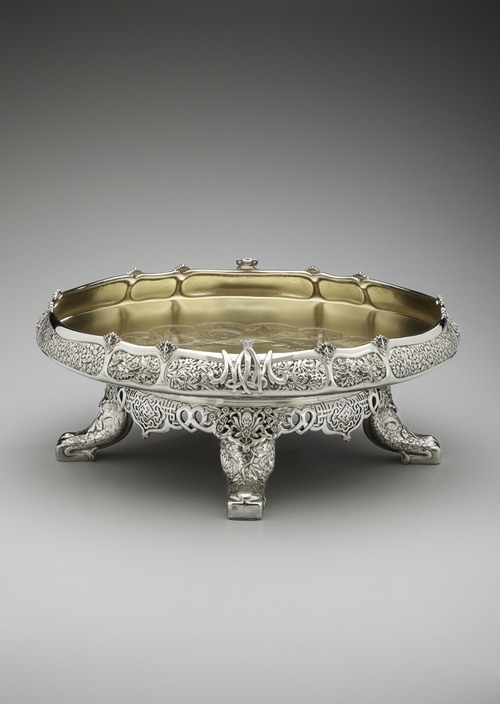 Well, the object I have chosen is the silver ice cream dish currently found in the Stories in Sterling exhibit (yes, that’s a hint for you to come here and go and look at it). I have discovered a lot from this seemingly simple (yet intricately and ornately designed) ice cream dish; the most interesting of which is probably the history of ice cream. Fun Fact # 1: According to the Canadian Dairy Info Centre, the average American consumes five gallons of ice cream each year. What is ice cream? Surely this should be an easy thing to define, yet different countries have different definitions of ice cream. Ice cream, earlier known as iced cream or cream ice, is a frozen dessert generally made with dairy products, traditionally milk and cream, combined with fruit or flavorings. The terms “frozen custard”, “frozen yogurt”, “gelato” and “sorbet” are used to refer to variations on the dessert. Fun Fact # 2: Ice cream in the U.S. requires a minimum of 10% milkfat to be labeled “ice cream”. Frozen custard is a frozen dessert similar to ice cream but made with eggs in addition to milk and cream. The butterfat and egg yolk give frozen custard a creamier texture and a smoother consistency than ice cream. Frozen yogurt is a frozen dessert made with yogurt and sometimes other dairy products. It tends to be tarter than ice cream as well as lower in fat, due to the substitution of milk in place of cream. Gelato is a frozen dessert made with milk, cream, various sugars, and flavorings, such as fruits and nuts. The ambiguousness of gelato can be traced to the fact that different gelateries have different ways of making gelato. However, it is generally true that gelato is lighter than ice cream because it has a lower butterfat content. Sorbet is a frozen dessert made from sweetened water flavored with fruit, wine or liqueur. In the United States, sorbet and sherbet are often confused although they are in fact two different products. To Americans, sherbet is far more common and usually refers to a fruit flavored frozen dessert with a butterfat content between 1% and 2%. Sorbet in the United States is thought to be a fruit flavored frozen dessert with no dairy content. Fun Fact #3: Sorbet is sometimes served between courses to cleanse the palate. Humans have long had a fascination with frozen desserts. Ice cream, in some form, has existed since at least before 400 BC. 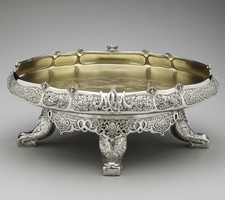 In the Persian Empire, people would pour grape juice over a bowl of ice and eat it, especially when it was hot. The ice was stored in underground chambers called “yakhchal”, which kept it cool. According to BBC reports, as early as 200 BC the Chinese served frozen mixtures of milk and rice as treats. Roman Emperor Nero had ice brought down from the mountains during the summer and added fruit toppings. The Arabs are credited as the first to use milk as an ingredient in ice cream. Ice cream was first introduced to the United States by Quaker colonists who had brought their recipes with them. First Lady Dolley Madison supposedly served ice cream at her husband’s Inauguration Ball in 1813. Recipes for ice cream first appeared in England and America in the eighteenth century. 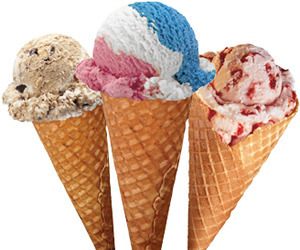 Fun Fact # 4: The U.S. produces more ice cream than any other nation in the world. Some popular ice cream companies in the U.S. are “Baskin-Robbins”, “Ben & Jerry’s”, “Cold Stone Creamery”, “Häagen-Dazs”, and “Edy’s”. Fun Fact # 5: The U.S. celebrates National Ice Cream Month in July. Baskin-Robbins began as two separate ice cream parlors: Burt Baskins’ Burt’s Ice Cream Shop and Irv Robbins’ Snowbird Ice Cream. Snowbird Ice Cream was known for its 21 flavors, which was a novel concept at the time. When the two companies merged in 1953, this number grew to 31 flavors. The first thirty-one flavors included such exotics as banana nut fudge, chocolate mint, chocolate ribbon, coffee candy, egg nog, green mintstick, peppermint stick, pineapple sherbet, and vanilla burnt almond. Baskin-Robbins is distributed internationally. Fun Fact # 6: Some of the most unusual flavors of ice cream ever made are avocado, garlic, azuki bean, jalapeno, and pumpkin. Ben & Jerry’s was established by lifelong friends Ben Cohen and Jerry Greenfield in 1978. The first ice cream parlor opened in 1981 on Route 7 in Shelburne, Vermont. Ben & Jerry’s is known for their quirky and original flavors as well as their social activism. Ironically the first flavor was plain vanilla. Ben & Jerry’s is distributed internationally. Fun Fact # 7: To protest the opening of the Arctic National Wildlife Refuge to oil drilling, Ben & Jerry’s created the largest ever Baked Alaska, weighing 900 pounds, and displayed in front of the Capitol Building. Cold Stone Creamery was created by Susan and Donald Sutherland in 1988. The first ice cream parlor was opened that same year in Tempe, Arizona. The name refers to the frozen granite stone used to mix “mix-ins” into flavors of ice cream. The company is known more for the possibility of its additions than any actual flavors. Cold Stone is distributed internationally. Fun Fact # 8: The biggest ice cream sundae ever made was 12 feet high and made with 4,667 gallons of ice cream and 7,000 pounds of toppings in Anaheim, Calif., during 1985. Häagen-Dazs was founded by husband and wife Reuben and Rose Mattus, two Jewish immigrants from Poland, in 1961. The name “Häagen-Dazs” is completely fictitious and while it is meant to sound Danish (in honor of the fact that Denmark was the only nation during World War II to decently treat Jews), it means nothing in Danish. The first ice cream parlor opened in Brooklyn, New York on November 15, 1976 at 120 Montague Street. The first three flavors were vanilla, chocolate, and coffee. Häagen-Dazs is distributed internationally. Fun Fact # 9: Ice cream is an $11 billion retail industry. Edy’s originated in 1928 as Edy’s Grand Ice Cream as a North Carolina business partnership between Joseph Edy and William Dreyer. In 1953, William Dreyer, Jr. took over and changed the name to Dreyer’s Grand. In 1981, the company re-adopted the name Edy’s Grand Ice Cream when marketing east of the Rocky Mountains to avoid confusion with Breyers. Edy’s was the first to serve Rocky Road ice cream, in 1929, a creation of theirs. Edy’s is distributed internationally. Fun Fact # 10: More ice cream is sold on Sunday than any other day. In India, a seasonal treat is called kulfi. It is essentially ice cream but as it is made of milk boiled down into a thick liquid, it has a much more granular consistency. It is usually sold frozen on a stick and the flavors tend to be appropriate to the climate – mango and dried fruit are two popular options. Southern Turkey is known for making ice cream with sahlab (ground orchid root). This ingredient changes the texture of the ice cream giving it a strange elasticity. This elasticity makes the ice cream soft and stretchy. Sahlab ice cream is popular in Iran and Lebanon as well. Malaysia’s frozen dessert is ais kacang (iced beans), a type of shaved ice treat. A bowl is filled with red adzuki beans, colored gelatin cubes, sago pearls, sweet corn, and crushed peanuts, which are mixed with shaved ice, condensed milk, and rose syrup. Germany is known for its bizarre spaghettieis (spaghetti ice cream). Vanilla ice cream is drawn through a pasta maker to resemble spaghetti and doused in strawberry or raspberry jam, which serves as the equivalent of tomato sauce. White chocolate or coconut flakes finish off this creation, serving as the equivalent of parmesan cheese. South Korea boasts patbingsu, a summertime dessert made from shaved ice mixed with red bean past, condensed milk, fresh fruit, ice cream, and cereal. Every café and restaurant has their own variety, though adding green tea or coffee ice cream is the most popular. Frankincense is native to Oman’s Dhofar province, perhaps it was inevitable than that someone thought to combine the frankincense with ice cream. American entrepreneur Trygve Harris infused milk with the frankincense oil as an experiment and ended up creating frankincense ice cream. Mochi is very popular in Japan. Mochi are small chewy, glutinous rice cakes dusted with powdered sugar. Japan has mixed mochi with ice cream to create two different variants. Mochi ice cream combines mochi with fruit flavored ice cream, whereas mochi ice cream balls are ice cream wrapped inside a layer of mochi. Jacob Riis, How the Other Half Lives. Is there something wrong in this picture? Clearly there is. What’s an elaborately designed lamp doing in a tenement house?